Garment bags are some of the most useful, practical and elegant things that you can take with you when going on a trip. Although their design is often similar to the one of a regular travel bag or luggage, a garment bag is different in many ways. Imagine that you have to go on a last-minute business trip and you must be ready to wear the suit that you carry with you immediately after landing. In order to look good, feel comfortable and make a good, professional impression, everything that you wear must be impeccably tidy. Garment bags are meant to keep your clothes wrinkleless throughout your journey, by maintaining a stable position thanks to a special design and several accessories. 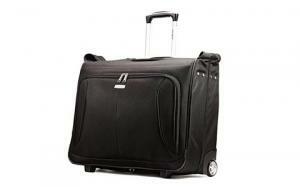 Buying a rolling garment bag is the best thing that you can do, especially if you are constantly on the road. Regardless of the means of transportation that you use, garment bags can keep your clothing and accessories safe, ready-to-wear and fresh. What’s the best garment bag for your needs? The market is pretty generous when it comes to garment bags. There are plenty of models out there, but they aren’t all the same and not all of them fulfill your requirements. It is important to analyze such a product’s pros and cons before buying it, so that you don’t come to regret your decision every time you unpack your things. Both low-cost and pricier garment bags are available on the market, yet the best models’ prices are always somewhere in the middle. These are only a few of the most important things that you should consider when making your final decision. Moreover, it is essential to open up the garment bag to see if the interior is suitable for clothing or shoes transportation. 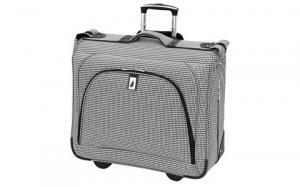 Are you looking for the best rolling garment bag for your travels? We have reviewed 5 of the best-selling products on the market and looked at all the factors described above. Take a look and make your decision today! Samsonite is a well-known brand that brings to the market all sorts of practical travel bags that fulfill all requirements and budgets. This time, it brings a polyester garment bag that is 8 inches high and 23.8 inches wide and comes with full interior lining. It has two skate wheels that make rolling extremely comfortable and smooth and it is equipped with a hanger hook bracket that makes it easier for you to keep your clothing wrinkleless. This garment bag has two pockets that are meant to be used for smaller, personal objects and accessories, as well as an extender panel that is designed for mesh or wetpak pockets. This is a great product for those of you who are looking for a model that is highly adaptable, ready to fit in additional clothes and very comfortable to carry. This garment bag from Delsey comes at a slightly higher price, with a nice, compact design and two colors that you can choose from: black and blue. Its exterior is made of polyester, while on the inner side, it is covered in fabric lining. The dura tec fabric that it is made of is water resistant, so your clothes and accessories will stay clean, fresh and dry regardless of the weather or humidity level. This product is 20 inches high and 9.8 inches wide, it has reinforced corners that protect it from shocks or falls and the exterior fabric is scratch-resistant, which means that even after countless travels, your bag will still look as good as new. It looks like a durable product that will make an impression. This Samsonite garment bag is probably one of the products on our list that will make you fall in love at the first sight. It comes with a unique book-opening design, it has a compact shape and four high-quality wheels that make it way easier to move around, especially when you have to move fast and take corners. It measures 22.5 x 22 x 10 inches, it has extender panels, two modesty pockets at the top and a hanger hook bracket on the inner side. Although this garment bag is, also, too big to be used as a carry-on bag in airplanes, its size allows you to carry with you two or more suits, depending on their size and thickness. Its four wheels make it easy to maneuver and its handle is extremely comfortable comparing to other brands’ products. This is an amazing garment bag that is worth investing in, yet it is way pricier than simpler, similar products, which is why you should think twice about this investment. If you are looking for a garment bag that has a less boring design, then you should definitely take a closer look at this product. You can choose between black and white and olive, yet the colors are not the only ones that define the uniqueness of its design. This garment bag comes with an unusually large outer pocket that is rounded and makes it look visually pleasant, but also makes it practical. Also, it has a tiny, integrated handle, except for the telescopic one, that makes it easier to grab when in a rush. The London Fog Cambridge bag has a book-opening design with a zipped closure. It has two in-line wheels that are made of polyurethane and allow you to roll the bag smoothly and comfortably. It measures 22.5 x 4 x 44 inches, which means that it can be used as a carry-on luggage during flights, unlike the other models on our list, More than that, it is fairly priced and fits up to three suits. This 22.5 inches high and 44 inches wide garment bag is nicely designed, comfortable to carry with you anywhere you go and, unlike the other products on our list, it has a shoulder strap that can be extremely practical. It comes in one size and two colors: black and olive green. It has a stylish design, with one of the largest front pockets and two in-line wheels that make it very easy to carry around. This bag’s telescopic handle is thin, yet sturdy and easy to maneuver. Overall, it measures 24 x 10 x 1 inches. Its inner side has plenty of pockets of different sizes that are designed for one or two suits, depending on the thickness of the material and its size. If you are packing thinner suits, you can fit in up to four of them. This product is the most affordable on our list, which is why it is ideal for those of you who are on a tight budget, yet need a nicely designed, practical garment bag. Can you really travel comfortably with a garment bag? 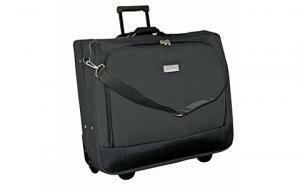 Garment bags are designed to fit clothing and personal belongings for a few days. They are usually small-sized, compact and have very well organized interiors. The reason why they are called garment bags is that they are meant to help you organize your clothes without wrinkling them. If you travel a lot and you really aren’t a fan of ironing, this type of luggage is perfect for you. By comparison to a regular suitcase, you have a designated space for your suits, shirts and any other piece of clothing that needs to be wrapped nicely and safely. More than that, with a garment bag, folding and getting everything ready is much easier. In the past, garment bags had exactly the same purpose, but weren’t as comfortable to travel with as they are today. Modern models come with wheels and a telescopic handle. They can be made of waterproof materials and usually have a durable zippers. Some models even have a special shoes compartment that has odour protection. Therefore, if your purpose is to travel for a couple of days and you want your suits and shirts to be perfect when you take them out of the luggage, a rolling garment bag is the perfect option for you. Is a garment bag suitable for business trips? A business trip is usually short and implies having impeccable outfits that make an impression. At the same time, any business trip is more or less stressful, busy, leaving you with almost no time to rest. Between catching planes, organizing your day, making sure that you can check everything off of your agenda and going out with your business partners, there is no time left to think about what you are going to wear. Additionally, it is naïve to think that you will have time for ironing. That is, if you want to sleep, as well. 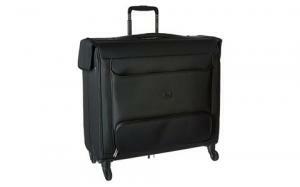 Rolling garment bags are designed to suit exactly the needs that were mentioned above. The great thing about most models that you can find on the market is that they are equipped with bags and hanging accessories. This way, you can immediately hang your clothes in the hotel room’s closet and prevent them from getting wrinkles. What is the best luggage for short trips? Short trips are usually very busy, which is why you need a luggage that offers you a space that is easy to organize and compartments that will not wrinkle your clothes. This is something that expensive and large suitcases can bring, but if you want to travel for a couple of days, you need a small bag. 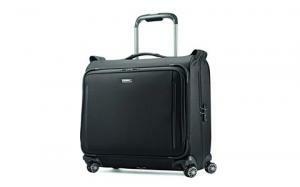 In that case, a garment bag with high-quality wheels that you can carry with you in the airplane cabin is ideal. If your traveling opportunities imply sports rather than business, then a garment bag with a different design, with an athletic touch, can prove to be great for your needs. Even if you are only traveling for fun, you will find that this kind of bag lets you enjoy your time more and worry about your outfits less. Traveling can be extremely fulfilling, regardless of the purpose of the visit in a new destination. You get to see new places, meet new people, experience new lifestyles and widen your perspective overnight. However, when traveling with the wrong garment bag, the entire trip can turn into a failure, as the clothes that you are supposed to wear can make you look bad and feel really uncomfortable. Buying one of the best garment bags that the market has to offer is not easy, but it is possible if you take a good look at products that have positive reviews and at those that seem to be made of high-quality materials. Generally, you can tell if such a bag is durable and practical simply by looking at its shape, materials and weight. If a garment bag is heavy, it will probably be too difficult to carry and maneuver and it will not be made of sustainable materials. Also, if it is too small, it will not fit it as much clothing as you need and it will wreck your nerves. The shape of a travel bag that is meant to keep your suits wrinkleless is also important to look at, as round-shaped bags usually do not allow you to fit in so many things. In order to choose the best garment bag for your needs, you must first set a budget, determine your exact needs and plan your trips ahead. Think about the frequency of your flights before buying such a product, as its quality and price could depend on this. If you travel a lot, you will need a bag that is sturdy, has a good zippers and a sturdy telescopic handle. On the opposite, if you are an occasional traveler, you can choose a cheaper model that fulfills your requirements. You know that you need a rolling garment bag but you don’t know what to buy yet? As stated in the first paragraphs of this article, when in doubt, it is recommended to choose the middle way, as it is usually the best. Choosing a product that is fairly priced, made of superior materials, yet does not include the latest technologies is the best option, especially if your budget is tight.